From explosions and gunfights to a simple rain shower, special effects can be found in every scene of a television drama. DQ visits SFX experts Artem to discover some of the secrets of the trade. The explosions are deafening. Three people are walking together across a small patch of grass, surrounded by a cacophony of booms, bangs and crashes as fire and smoke fill the air around them. The ‘battlefield’ recreation is the climax of a stunning display of special effects created and performed by the team at Artem. 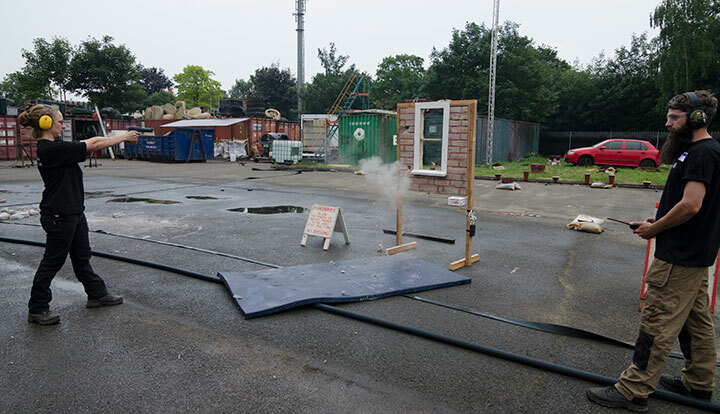 The crowd that gathered for the 30-year-old company’s open-day demonstration also saw willing volunteers punch through ‘concrete’ walls, reproduced with a highly realistic material called Softcrete; have a ‘glass’ vase smashed over their head; and shot, leaving blood packs to empty their contents through puncture wounds in their clothes created by remote-controlled detonations. UK viewers will already have seen some of Artem’s work on screen, with the company having contributed effects to shows such as Sky’s supernatural series The Enfield Haunting, BBC true crime drama Rillington Place and ITV’s domestic drama Him. The firm also created an exploding Christmas pudding for a festive episode of BBC period drama Call the Midwife. Many examples of Artem’s work are also on display around its West London workshop, from a towering model of Master Chief from the Xbox Halo games to robotic versions of Brian the Robot and the Churchill dogs from some well-known insurance adverts. Particularly impressive are the items found in the sculpting and moulding department, where there are exquisitely detailed bricks made from foam, propane tanks that can be lifted with one hand and marmalade sandwiches that featured in recent big-screen hit Paddington 2. On a nearby table are a prosthetic heart, brains and a piece of a lung. There is also a full-scale model of a corpse from Macbeth, the 2015 film adaptation of William Shakespeare’s tragedy starring Michael Fassbender. Leading the demonstration is Artem CEO Mike Kelt, who puts himself in the firing line by accompanying two visitors through the battlefield experience. 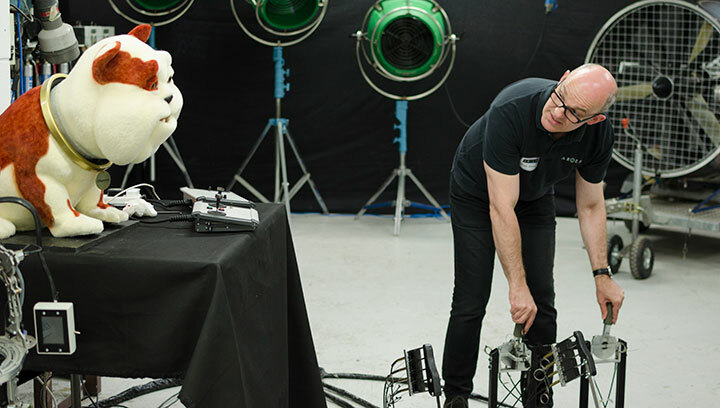 Kelt and his fellow company founders Simon Taylor and Stan Mitchell formed the business after leaving the SFX department at the BBC, where they had learned their craft –everything from prosthetics to fire and explosions. Initially planning to focus on television, the company soon started working on commercials and has since moved into film, live events, music videos, games and visitor attractions. 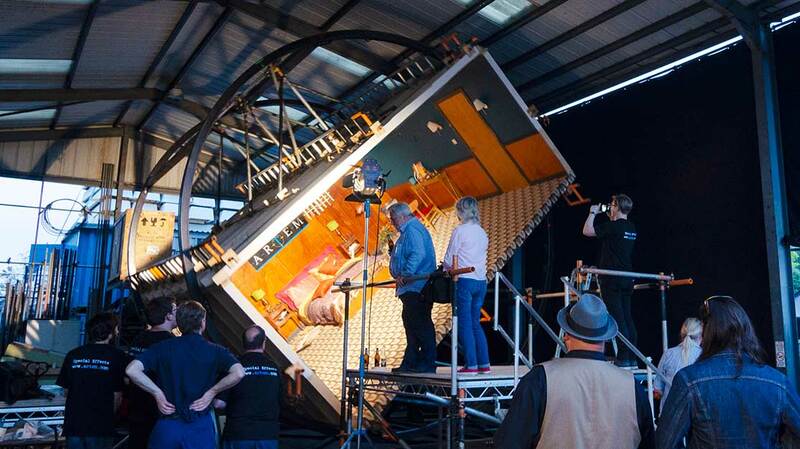 Their recent work includes building a full-size replica of one of the panels of the Elgin Marbles for FX drama Trust, making a sculpture for a Google ad, and using its ‘rollover rig’ (pictured top) – which can turn a set upside down – to film the music video for Lily Allen’s recently released single Lost My Mind. Artem – whose motto is Ars est celare artem (Art is to conceal art) – was also involved in forthcoming BBC1 drama Bodyguard, which sees Richard Madden play protector to Keeley Hawes’s home secretary in a six-part action drama created by Jed Mercurio (Line of Duty). “That was quite fun,” Kelt reveals. “We did various things. One of the more interesting and challenging things in the script was a bomb goes off in an auditorium, and they wanted to have people very close to it. We built a section of the stage that was breakable and we put all the pyrotechnics below that, so when it went off, the stage erupted. They wanted it to be quite realistic, so it’s not just a big fireball – it’s a more a high-explosive dust cloud. We set that off and it was great. Despite both the advancement of and demand for SFX in television today, Kelt notes that budgets haven’t improved greatly, though he adds there is interest from the US in making series in the UK and taking advantage of local effects houses. Artem employs 33 people full-time, with more on standby throughout the year, while it also has a second workshop in Glasgow, Scotland. But with SFX increasingly advanced and in greater demand, Kelt highlights a lack of skilled people available to work on Artem’s projects. Internally, Kelt and his partners are helping to ensure those coming up through the company will be able to take it forward when those who have been there from the start head into retirement. Before then, however, he is still looking at ways to expand Artem in the UK and internationally.